Everybody lives busy lives and making time for home tasks can be hard. Spending an afternoon watching college football or going apple picking is a lot more fun than doing maintenance. But, as a homeowner, the consistent upkeep of your home helps to preserve your home’s value and prevent some avoidable and costly damage. Which can translate to more money in your pocket! Maintenance in the fall is essential since it’s sandwiched between the hot days of summer and winter’s harsh freezing weather. It can be a productive time for you to complete certain tasks that are better suited for its cooler days. Plus, these projects in the early and late fall can prepare your home and yard for the harsh days of winter ahead. Many homeowners are hit with expensive damage that could have been prevented in the first place. Don’t let that happen to you! Now is a good time to look at your calendar and schedule some must-do projects over the next couple of months. Even if you live in a condo unit, there are still some yearly tasks that you should check off your list, such as HVAC maintenance. Your condo association should handle common areas but each association can vary on unit owners’ responsibilities. Double check on this and keep the tips below in mind. Some projects can be DIY jobs but others may require a professional. For some tasks, it’s better to sign up for a yearly service contract (i.e., HVAC, chimney, pest control). We can provide you with a list of reputable contractors! Don’t feel overwhelmed with our list of fall tasks below. 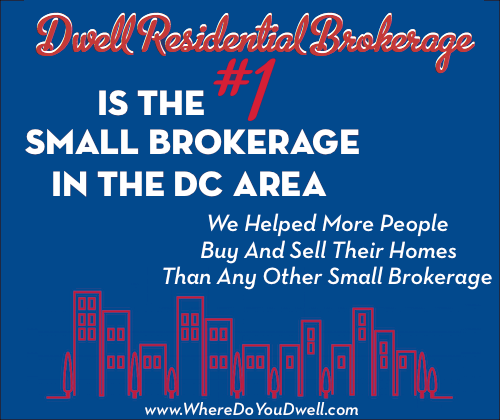 It is longer than other seasons and many might not pertain to your particular home. But if you stay organized, it won’t be too hard to handle. We recommend creating a maintenance binder or downloading a maintenance app for your iPhone or other device so you can schedule and record your repairs and upkeep. That way, you’ll know exactly what you have to do each month and how to budget for it. On certain apps you can even set up alerts to remind you. Having a system in place means you’ll be able to store information on repair dates and costs, contact info for contractors, any receipts from purchases, warranties, model numbers and manufacturer materials. 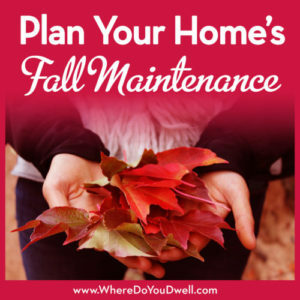 You can customize our list below for your own home and put it in your binder/app for fall maintenance. You can also download our handy PDF sheet. Add or replace weather-stripping around doors and windows to keep out drafts. Caulk around windows where cold airs gets in. Get a good storm door for your entrance. Consider getting plastic shields to protect basement window wells. Insulate your attic and look at the benefits of cellulose insulation over fiberglass. Give your windows one more thorough cleaning (it’s still warm enough to do this and have nice clean windows before winter hits). Hire a professional to inspect and clean your chimney. Check to make sure the damper works properly. Close the damper when not in use, but don’t forget to open it before lighting a fire. Examine for loose bricks and mortar and get it repointed. The earlier you catch this, the better. You want to avoid water damage and rebuilding a new chimney. Make sure your chimney is lined, even if you don’t have a fireplace. Many gas hot water heaters and heating systems are vented through a chimney. Cap or screen the top to keep out rodents and birds seeking refuge. Buy firewood but store it away from the exterior of your home (it can attract rodents!). Consider installing a gas fireplace if you have a gas line nearby. More natural-looking logs and ease of use make them ideal for many homeowners. Furnace, Ducts, AC Unit & Etc. Hire a HVAC professional to inspect and clean your furnace. Also check your whole-house central humidifier unit to make sure you’ll have the right amount of moisture in the air (can help prevent winter colds). Stock up on furnace filters and change or clean them monthly depending on which type you use. Dirty filters make it more difficult for your HVAC system to work efficiently and will also limit the amount of dust, lint, airborne molds that go through your system. Drain air conditioning pipes and turn off its shut-off valve if you have one. Your HVAC professional may do this for you. Hire a professional to inspect air ducts for leaks in their joints; and have them cleaned if necessary. Ducts in cold spaces such as attics, basements, or crawl spaces should be insulated. Remove and store window AC units if you have them. Clean dryer vent by vacuuming the tube that leads to the vent and then vacuum from the outside dryer vent. This should be done every six months so include on both your fall and spring maintenance schedules. Clean and disinfect your portable humidifier if you have one in order to prevent mold and bacteria growth in the standing water. Buy a programmable thermostat (so many less expensive ones to choose from now!) that allows you to set temperatures lower when you’re not at home or sleeping. You’ll save money! To prevent pipes from bursting, never set your thermostat below 55 degrees. Clean out gutters and downspouts of leaves and debris. Depending on where you live, you may have to clean your gutters several times in the fall. Blocked gutters can cause water damage to your home at any time. But in the winter, blocked gutters will trap water that can freeze, causing gutters to detach from your home. Many homes in DC have area drains near back doors or in their yards; make sure you clear those out of debris too. Make sure your gutters are directed so that they drain as far away from the house as possible and on a downslope. Check on this regularly during rainstorms to prevent major water damage. Inspect roof for any damage to shingles and double check seals around vents and chimney to prevent any leaks. Seal foundation cracks to prevent mice from sneaking in. Drain outdoor faucets and winterize in-ground watering systems so you don’t get burst pipes inside your walls. Your plumber can show you how. Inspect your driveway for cracks. Seal it now to prevent winter damage. Rake leaves regularly in yard so you aren’t overwhelmed with one big job at the end of the season. Check your community’s leaf pick-up services, requirements, and schedule. Remove and weed any dead plants, especially those summer and early fall annuals. Prune shrubs before they go dormant. Cut back perennials; divide and transplant as needed. Aerate, fertilize, and seed your lawn in early fall. Plant bulbs now for springtime flowers. Look at catalogs and the internet for some ideas for your garden. Perennial flowers are less costly and time consuming in the long run, making your yard look nice with less work each year. Trim tree branches that hang too close to your home or electrical wires. You don’t want any surprises during a storm so hire a professional company to care for your trees and trim where necessary. Drain garden hoses and store them inside. Clean and then cover outdoor furniture (or store it inside). Winterize sensitive plants such as roses, and stake any shrubs or young trees. Buy and store flashlights, batteries, candles, and matches in easy-to-reach locations. Get those battery operated candles too if you’re worried about matches and small children! Keep extra water bottles, nonperishable food (for pets too! ), blankets and necessary medications on hand. Buy that snow shovel before it snows! Don’t forget bags of ice-melt (pet-friendly ones) and sand. Find the phone numbers for your utility companies and put in your phone’s contact list and any alert apps/text services that your community provides. Download our handy PDF sheet to print out or store on one of your devices. Let us know if you have any questions and if you need any suggestions for contractors that could help get your list of to-do’s done.